Let's face it, sometimes feeding a child can be a messy job. The last thing a parent wants is a spill and mess to clean up. Baby product brand Avanchy is proud to announce the launch of their solution to this problem, the Avanchy baby & toddler bamboo stay put suction bowls. Safe, attractive and fun, the suction plate can help make meal time a little less messy. 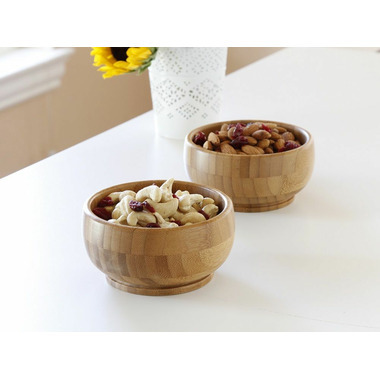 The Avanchy bamboo stay put suction divided plate combines foolproof functionality with the highest quality natural materials for your stylish, healthy home. Avanchy Baby Bamboo Stay Put Suction Bowl and Spoon is the perfect baby, toddler or infant training bowl for your little angel. Great to take to restaurants! Bamboo is organic, biodegradable and easy to dispose of responsibly. By choosing bamboo, you are helping the planet! Product Material: Organic bamboo: No fillers, BPA Free, Lead Free, Plastic Free and Phthalate Free. 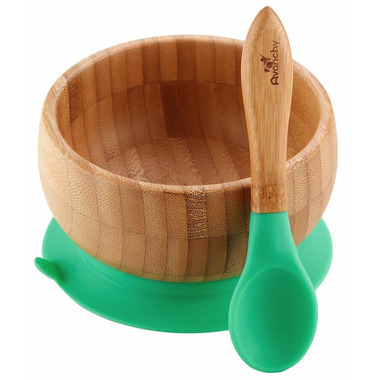 Great bamboo bowl for those of us worried about chemicals in the plastic bowls. Easy to clean, suction cup works well. Only wish it's microwavable. A great little bowl. Our almost two year old loves it. He can reach in with his hands and/or use the spoon. The suction grip works very well. Clean up is great. Have seen smaller versions of the same bowl from the same company for much higher price at other stores.